You'll see plenty of over-the-hill signs and black balloons for 40th birthdays. Fact is, turning 40 means reaching the prime of your life. Unique 40th birthday gift ideas should be something that celebrates life, instead of focusing on being over the hill. Turn traditional ideas into unique 40th-birthday gift ideas. A soothing bubble bath is a great 40th birthday gift idea, instead of the expense and traditional spa gift certificates. Do this for your significant other as a romantic birthday gift. Fill the tub with bubbles and light candles in the bathroom. Give your significant other time to take a peaceful and relaxing bubble bath. Heat a folded bath towel in the microwave for 10 to 15 seconds on high heat. The warm towel will feel wonderful! Who doesn't want to be famous at some point in life? You can order personalize magazine covers or newspaper front pages as a 40th birthday gift. Choose a magazine title, magazine headline and photo of the birthday recipient to go on the personalized cover. Select headlines and announcements for the personalized newspaper front page. Use the recipient's actual birthday date for the issue date for either one of these. Frame the cover or front page to complete the gift. Give the birthday person a stone that symbolizes the bond and friendship you've had through the years. Select a stone that is meaningful to you or to the both of you and have it strung on a necklace. Include a note about how much you treasure the friendship. The birthday person will think of you each time he or she wears the friendship stone necklace. 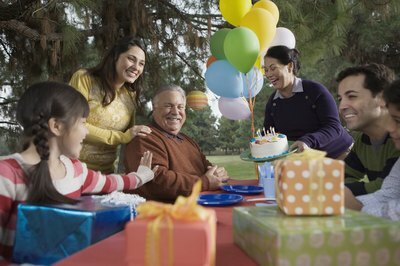 A gift in honor of the birthday person is a wonderful way to celebrate this milestone birthday, particularly if the celebrant doesn't like to receive gifts. Select a charity, non-profit organization or cause that would be meaningful. In the birthday card, let the recipient know that a donation was made as a birthday honor and name the organization. Some organizations will have honor cards that you can wrap as part of the birthday present.